With Doctor Who now firmly entrenched in its year of special episodes as David Tennant’s time in the titular role nears its end, ‘Planet of the Dead’ being the first to air since Christmas with another not scheduled until near Halloween, there’s a greater impetus for each story to do something spectacular. 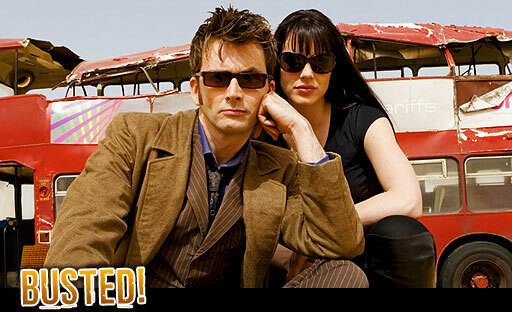 Yet despite some magnificent guest casting and stellar special effects with breathtaking vistas due to location shooting in Dubai and in high definition, ‘Planet of the Dead’ is very much a lighter and very average episode of Doctor Who, not challenging viewers too much after their Easter festivities and meals. In fact, this is the first Easter ‘special’ in the show’s long history, a fact that the Doctor acknowledges by saying that he can never find Easter since it switches days every year. With the help of the other passengers on board as well as an enthusiastic scientist back at UNIT, the Doctor has to find a way to get a bus back to Earth after it passes through a wormhole and becomes stranded on the arid planet of San Helios. Michelle Ryan is the big guest star of the episode, her character Lady Christina being a thief who hails from a wealthy and privileged background. She ends up being a rather interesting character, initially unlikable due to her smug air of superiority that she carries about but gradually showing a softer and more caring side as events progress and she begrudgingly begins to help with the escape attempt. As a one-off companion, she fills the role ably, but her character as written is certainly one who wold need to be softened a bit were she ever to come back more permanently. In a way, the setup of ‘Planet of the Dead’ is quite comparable to that of ‘Midnight’ where the Doctor is trapped with a group of people who only want to get home as events become more and more strange. Unfortunately the intricate and detailed characterization from ‘Midnight’ is lacking here for the other passengers, meaning that the teenagers Nathan and Barclay, the high-strung mother Angela, and the loving elderly couple Lou and Carmen fail to become truly memorable. Back on Earth the picture is rather grim as well as the alien metal stingray menace readies to invade. Noma Dumazweni’s Captain Magambo returns for the first time since ‘Turn Left’ as she spearheads UNIT’s attempts to keep the situation controlled, but it’s Lee Evans’s scientific advisor Malcolm who audiences will remember more, for better or for worse. Malcolm is a brilliant man- he even names a unit of measurement after himself- and proves vital in resolving the invasion issue, but some fans may be put off by just how fanboyish he is when conversing with the Doctor. While it’s great to hear references to classic adventures such as ‘Robot,’ his character borders on being over the top and proves to be a rather extreme parody of a typical Doctor Who fan. David Tennant does very well here, and although the script doesn’t necessarily challenge him or force his character to explore hidden depths, it is refreshing to see him a bit more light-hearted than in ‘Journey’s End’ and ‘The Next Doctor.’ In fact, with the humour of the character restored and another kiss with the leading lady, everything that makes the Tenth Doctor memorable is present here, buoyed by a dramatic conversation about Donna. James Strong offers a sterling bit of direction in ‘Planet of the Dead,’ making the most of the Dubai filming even if the production was apparently plagued by sandstorms and the delivery of a damaged bus, something that actually worked in the episode’s favour by lending an air of realism to the tumultuously transported vehicle. That said, there really is no reason why the episode has to be filmed in Dubai other than to offer spectacle. The events could have taken place just as easily in a typical quarry or any other isolated area. There’s a sense of extreme self-confidence throughout the episode- and rightly so- but the overseas filming adds nothing but striking visuals to the story. The Tritovores are an interesting one-off alien species, decidedly channeling the feel of a classic era foe with their costumes, but it’s the metal stingray creatures that certainly steal the show in their limited time on screen. The truth about the planet’s once-thriving city is shocking, and the stingrays would certainly be a welcome addition to the list of recurring aliens should they ever return given how quickly and how overtly dangerous they are. All in all, though, ‘Planet of the Dead’ is a perfectly adequate episode of Doctor Who, but it’s certainly not one that achieves what a ‘special’ would normally entail. It’s a decent enough way to pass the time, but there’s not a great amount of progress for the Doctor as his time ends, though the premonitions of his song soon ending- echoing Sigma Ood’s sentiment in the previous series- as well as of someone returning from the dark and knocking four times will certainly become more meaningful in Tennant’s remaining three episodes.